Quackery is short for quacksalver and probably has nothing to do with the sound made by ducks. 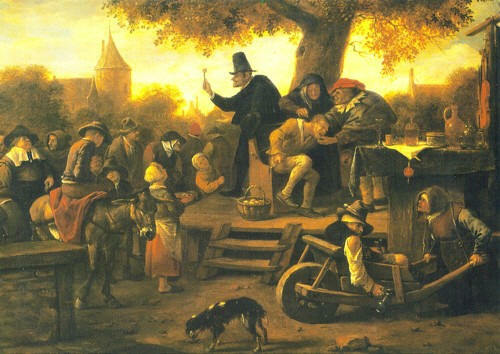 Quacksalver derives from two Middle Dutch terms and seems to mean healing with unguents. However, quacken means to boast, so a kwakzalver might be a healer who boasts, in which case medical quackery would be an oxymoron. Another possibility is that a kwakzalver is somebody who applies ointments or unguents haphazardly. The verb kwakken roughly translates as to throw something (on) carelessly or haphazardly. Dr. Polevoy is dishonest, closed-minded; emotionally disturbed, professionally incompetent, unethical, a quack, a fanatic, a Nazi, a hired gun for vested interests, the leader of a subversive organization, and engaged in criminal activity (conspiracy, stalking of females, and other unspecified acts) and has made anti-Semitic remarks. In Holland, however, a federal judge has ruled that calling someone a quack (kwakzalver) is equivalent to calling him a fraud. The court ruled that kwakzalver conveys to the general public that someone is a swindler and practices medicine unlawfully. The court based its decision on what it considers the most authoritative Dutch dictionary at present. Critics of quackery might often believe that the quack is a swindler but that is not their usual meaning. From a critic's perspective, a quack is not always a swindler but he or she is always promoting or practicing a treatment of which the supposed benefits are unsubstantiated. This does not mean that there is no evidence for the quack treatment. There are always testimonials from satisfied customers that can be cited as evidence any treatment works. There are sometimes poorly designed or incorrectly interpreted studies put forth to support a quack treatment. To say a treatment's alleged benefits are unsubstantiated means that there is no compelling evidence supporting its claims of efficacy. Usually this means that the treatment has not been scientifically tested, that the scientific evidence for its efficacy is very weak, or that it has consistently failed scientific tests of its supposed benefits. Many quack medical practices have endured for decades or centuries and much study has gone into trying to figure out why they appear to be efficacious. The following are considered quackery by most defenders of science-based medicine: acupuncture, chiropractic, detoxification therapies, faith healing, homeopathy, iridology, naturopathy, reflexology, and therapeutic touch. One area where quacks seem to circle is among those dying of cancer. Since most quacks have good intentions and are simply deluded about their work, the Dutch court has eliminated quackery by requiring that a quack be an intentional swindler. The court has found an efficient way to eliminate both quackery and criticism of dangerous kooks by its ruling. Kevin Trudeau should be proud. See also ad hoc hypothesis, Edgar Cayce, communal reinforcement, confirmation bias, control study, faith healing, holistic medicine, integrative medicine, Occam's razor, placebo effect, post hoc fallacy, pragmatic fallacy, regressive fallacy, selective thinking, self-deception, subjective validation, testimonials, and wishful thinking.